Midnight is a primary biome type characterized by dark trees, dark obsidian and ash. Midnight planets have no daylight, and even though there may be a sun visible in the sky the planet remains clouded in darkness day and night. Midnight planets are an 'extreme' threat level, geared toward tier 5 in progression. There are small structures, populated by strange shadow humanoids. 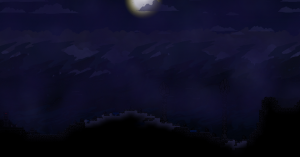 Midnight biomes can be created and expanded using a Dark Terraformer, and a planet will convert to a Midnight planet once half of the planet's surface has been terraformed into Midnight biome. Midnight planets can be found orbiting frozen (blue) and fiery (red) star types. Unless players have a Heating EPP Upgrade equipped they'll take increasing damage while on the surface from deadly cold. A Cooling EPP Upgrade also will protect against the planet's cold. This is a dark world where the sun never rises. The surface is dangerously cold. You should prepare yourself both mentally and physically before landing here. This dark world is perilously cold. Strange shadowy figures dwell here, hidden in the unremitting night. Scans show that the surface is dark. In fact, scans show little else on account of all the darkness. However, I surmise that the surface is dangerously cold. The surface layer of midnight biomes is primarily made up of tough obsidian, along with ash, and cobblestone. There's gatherable wood from the dark trees which also drop plant fibre. The planet's primary color in the navigation console is always black, and so is the obsidian it's made from. Shadow Bricks Block 0 Bricks carved from shadowy rock. Shadow Chest Storage 85 A dark, shadowy chest. Shadow Marker Decorative 110 A mysterious flag marker. What kind of leather is that? Shadow Shrine Decorative 175 A really creepy looking shrine. Shadow Shrine (2) Decorative 115 A really creepy looking shrine. Shadow Shrine (3) Decorative 120 A really creepy looking shrine. Shadow Spike Block Block 0 A spiked block formed from shadowy material. Tungsten Chain Block 0 Tungsten chains, and not the fun kind. Wind Chimes Decorative 100 Many find the gentle ringing of wind chimes like these quite soothing. Midnight biomes, due to being in perpetual darkness, use a unique set of tracks for both "day-time" and "night-time". 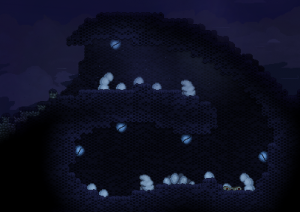 A small nest inside a hive mini biome. There are sub biomes which can be found on midnight planets in addition to their unique mini biomes. Desert, tundra, forest, snow, and barren have a chance to appear as smaller biomes on midnight planets. These biomes will include things like their associated blocks, trees, and crops when they appear. Mini biomes for each of these secondary biome types can appear inside them as well. Midnight biomes can also be found on a number of different planet types as sub biomes. They have a chance of being found as sub biomes on tundra, volcanic, and decayed planets. Hive and bioluminescence are mini biomes found inside midnight biomes. These mini biomes can be found on midnight planets or inside midnight sub biomes on other planet types. These mini biomes each have their own creatures and items outside what's available in midnight biomes. Both hive and bioluminescence mini biomes have luminecent features, making them easier to spot in the darkness of the planet. Bioluminescence - Colorful plants glow faintly, lighting up the area around this mini biome. Midnight planets stick to the standards for planetary layer composition. Weather on midnight planets is a perpetual dust storm. There are no other types of weather found on midnight planets. Boltbulb and Diodia can be found growing wild in midnight biomes. These can be harvested by interacting with them or by digging them up. They'll drop produce and have a chance to drop a seed which can be replanted. In addition to procedurally generated creatures, there are a variety of unique monsters, bugs and critters found in midnight biomes. Some of these are also found in other biomes, while others are unique only to midnight biomes. While these unique creatures have a chance to appear on midnight planets, they will not all appear on each one. In addition to unique creatures, each biome has multiple types of both procedural ground and flying creatures. There are a variety of items which are specific to chests found in midnight biomes. Some of these may have a chance of being found in other places throughout the universe, but they've all been specifically allocated to chests within midnight biomes. The Dark Disguise Set found in chests is a shade lighter than the Dark Set worn by shadow villagers, but shares the smokey effect when worn. Midnight biomes can have a large variety of settlement types found on them. These include small microdungeons and NPC camps, larger racial villages and hostile dungeons. Smaller midnight planets usually contain only one dungeon or village, while midnight planets can contain as many as three. Many small microstructures exist on the biome surface, commonly populated by shadowy figures.